The industrial agrifood system is in crisis regarding its negative ecological, economic, and social externalities: it is unsustainable on all dimensions. 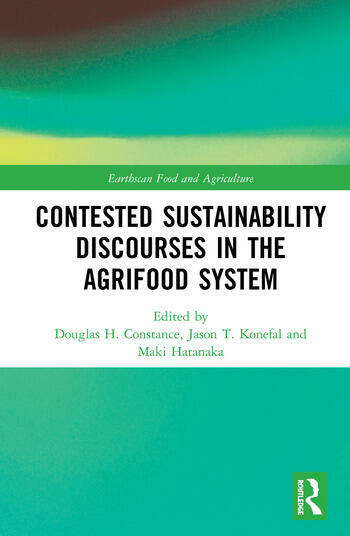 This book documents and engages competing visions and contested discourses of agrifood sustainability. Using an incremental/reformist to transformation/radical continuum framework for alternative agrifood movements, this book identifies tensions between competing discourses that stress food sovereignty, social justice, and fair trade and those that emphasize food security, efficiency and free trade. In particular, it highlights the role that governance processes play in sustainability transitions and the ways that power and politics affect sustainability visions and discourses. The book includes chapters that review sustainability discourses at the macro and meso levels, as well as case studies from Africa, Australia, Canada, Europe, South America and the USA. 2. Sustainable Intensification: Agroecological Appropriation or Contestation? 6. Zero Hunger Discourse: Neoliberal, Progressive, Reformist or Radical? 9. Discourses on Sustainability in the French Farming Sector: The Redefinition of a Consensual and Knowledge-intensive "Agroecology"
Douglas H. Constance is Professor of Sociology at Sam Houston State University, Huntsville, Texas, USA. Jason T. Konefal is Associate Professor of Sociology, at Sam Houston State University, Huntsville, Texas, USA. Maki Hatanaka is Associate Professor of Sociology at Sam Houston State University, Huntsville, Texas, USA.